Setting up a new monitor for Windows Vista is easy. In fact, changing out monitors on your Windows Vista system is simple as long as you ensure that you’re working with the most recent device drivers. Many manufacturers require that you install the monitor’s drivers before you connect the monitor. Read the instructions that came with the monitor, and if the manufacturer recommends it, install the software from the CD. The monitor should be connected before you proceed to the next step. 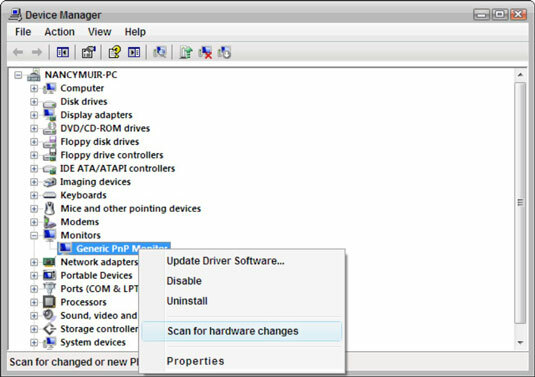 The Device Manager is the primary location on your computer for setting up device drivers. Click the plus sign to the left of Monitors to display installed monitors, and then right-click the new monitor and choose Scan for Hardware Changes from the shortcut menu. Monitors displayed in the Device Manager. You’ll see a message that scanning is in progress. If your monitor’s driver is up to date, the progress window disappears when the scan is complete. If your monitor driver isn’t up to date, the Hardware Update Wizard appears. Follow the wizard screens to install the monitor drivers. Many manufacturers’ device drivers are already stored in Windows. When the Hardware Update Wizard prompts you, you might find that you can simply browse the manufacturers’ device drivers rather than download them or select them from a CD. When the scan or wizard is complete, if everything seems to be working fine, you can close the Device Manager window.